Our family was bitten by the Walt Disney World "free dining" bug in 2005, so when the promotion was offered again this year, we planned another trip for the Labor Day holiday. We made our dining reservations in May. A few days before our trip, we made a last-minute decision to leave earlier than we originally planned, which would give us an extra day. That meant we had an extra table service meal to plan! I called Disney Dining to determine our options. Our choice had to be outside of the theme parks since we had no park tickets for that day. Every restaurant we considered was completely booked up. The Disney operator suggested the Turf Club Bar and Grill at Saratoga Springs Resort. We reserved a table for dinner for our party of five, my husband and our three teenagers. I'm by no means a professional food critic, but I love to eat, so I thought I would share a simple review of our experience at the Turf Club. On the evening of our dinner reservation, we drove the short distance from Port Orleans Riverside to Saratoga Springs Resort. Once inside the resort, we followed the signs to the rear of the resort where the Carriage House is situated. Both eateries in Saratoga Springs, the Artists' Palette and the Turf Club, are located in the Carriage House. From the parking lot we had a good view of the lake and Downtown Disney. We could see guests utilizing the walkway to Downtown Disney's West Side. We walked up the stairs and inside the Carriage House to check in at the Turf Club. We were 30 minutes early for our reservation, so we relaxed in the lounge area which has pool tables and other gaming sets available. The decor features deep cherry wood tones with hunter green and taupe accents. The Turf Club has both outside and inside seating. We saw only a couple of parties seated on the covered porch. Our table was ready in about 20 minutes after check-in. We were seated at a round table near the restaurant entrance next to windows overlooking the outside seating area. For appetizers, our son ordered the fried calamari. The calamari was a generous portion that could be easily shared. 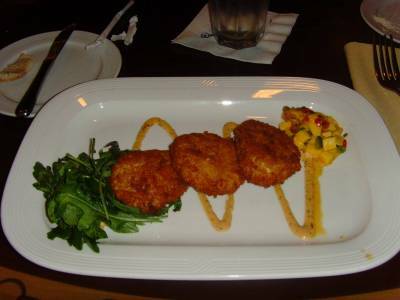 I chose the crab cakes with mango salsa, which consisted of three small cakes which were very tasty. My husband and daughter both ordered the buffalo chicken strips, to which our server German suggested that they order the buffalo sauce on the side as it was very spicy. This appetizer included three good-sized chicken strips. Our youngest selected the onion rings, which was probably the best value for an appetizer at only $4.99. The onion rings were served in a large basket with three dipping sauces and was more than one person could eat! Our entree selections were pretty simple. My husband, son, and I all ordered the Grilled Top Sirloin Steak. I chose to add the blue cheese, Portobello mushrooms, and balsamic-port glaze topping while my husband and son decided to top their steaks with crab meat and grain mustard sauce. My steak (ordered medium) was a bit dry, but the other steak eaters at our table (who ordered medium rare) declared theirs to be the best steaks they had ever eaten! The blue cheese topping on my sirloin had a sharp, salty taste and was well complimented by the balsamic-port glaze. The sirloin steak is served with a side order of Turf Club potatoes which are velvety scalloped potatoes that were heavenly! Both of our daughters decided on the Penne Pasta with Shrimp. They were a little disappointed that the pasta was not served with a cream-based sauce like they have eaten at other Disney restaurants. From the moment our kids first glanced at the dessert menu, all three were anxiously awaiting the chance to sample the Chocolate Lava Cake. When it came time to order dessert, German came to our table and informed us that they had unfortunately run out of the Chocolate Lava Cake. He explained that they had never been out of a dessert before, but there had been a larger crowd than usual at the restaurant that evening. After the let-down, most of our party ordered the individual apple pie with vanilla ice cream and the cheesecake with vanilla sauce and seasonal berries. My son and husband enjoyed the apple pie, but declared it to be a typical apple pie. I am a true cheesecake lover, and the Turf Club did not disappoint! The cheesecake was a very large portion, so large that two people could easily enjoy it. The vanilla sauce was so smooth and added just enough punch to raise this dessert from great to spectacular! Our server German took very good care of us. He was friendly and accommodating, and even offered to snap a picture of our entire group at our table. Overall, we were very pleased with the quality of food and the service at the Turf Club Bar and Grill and would eat there again. But, we'll check on the availability of the Chocolate Lava Cake first! About the Author: Michelle Clark is the mother of three teens who provide her with endless scrapbooking subjects! Michelle and her family are currently planning their 11th trip to Orlando's theme parks. She is also a PassPorter Message Board Guide.